Is there anything better than receiving notes from your friends and family to make your day just a little brighter? We don’t think so. 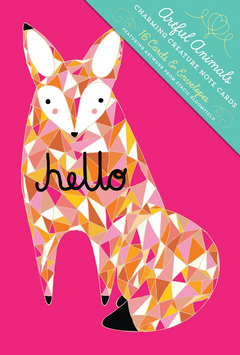 With Artful Animals, experience 4 different designs of notecards from artist and illustrator Stacie Bloomfield. From the slogan of “Stay Sharp” with a porcupine to “Beary Good” with an adorable bear, there’s no way you can go wrong. The abstract colors and shapes are both appealing and eye catching, and act as a simple yet thoughtful way to let somebody know that you are thinking about them. Specifically with the ‘hello’ greeting card, we feel as though including some Adele lyrics is a sure fire way to make someone laugh, don’t you agree? The art of letter writing is not lost! Inspire your friends and family with these notecards featuring adorable illustrations of Artful Animals Charming Creature Note Cards from artist and illustrator, Stacie Bloomfield, founder of Gingiber – Zest for Your Nest. Enjoy four different images of animals- a fox, owl, and more in her colorful, modern style- included with blank interiors for wonderful keepsakes that you can fill with messages from your heart. Enclose in one of the brown craft paper envelopes and send these adorable cards on their way to brighten someone’s day.